Superior images and lifelong performance in the most demanding industrial applications. 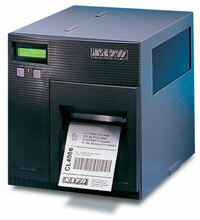 The CL408e printer delivers performance at an affordable price! The CL408e is an advanced performance, high value printer that is truly a SATO through and through. The CL408e features a 32-bit, high speed RISC processor for maximum performance. It also includes the exclusive SATO printhead control feature, which constantly monitors printhead conditions and automatically adjust print energy for optimum and consistent print quality. The CL408e prints labels up to 4.1" wide at 203 dpi all at speeds of up 6 ips. The SATO W00409121 is also known as SAT-CL408EUC	.